Below is a list of pages for each project, They should be self contained including any references outside of the site. I have been thinking about this for years but the stimulus was a letter I sent to Nuts & Volts Magazine. So with that in mind, we need to define what we want to do and how we want to do it. To do simple electronics experiments for learning and tinkering around the house or even workshop, we do not need as elaborate a setup as if we want to be CalTech or MIT Electronics Researchers. And it so happens we can work ourselves up to as high a level as we want (given the limits of budget and brain). I rather think I will peter out a bit before we reach MIT level, but it is nice to set a goal high enough to challenge us. So what do we need for the beginner Lab. I would say the first place to start on your own Electronics Laboratory is a place to set it up. 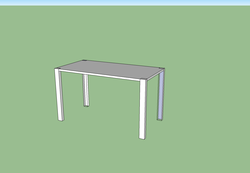 You need a decent work table or bench. power sockets for plugging in the many things a lab will have. You need good lighting and lots of storage areas too. OK, as for the worktable. Anything will do to start. One possibility is the Briefcase workbench I will be presenting in another of these pages. For those who have almost no room. But here we will assume you have a table that can be dedicated to your lab work. A desk works well as it has drawers for parts and tool storage. If you have a whole room you can dedicate, or a shared room (sewing room and electronics lab anyone? ), you can set up many shelves and bins. Look at the pictures under the Electronics page of my recent lab set up. It covers 3 walls and the 3rd is a closet full of priceless junk (depending on who is looking at it). What kind of a bench do we want and what needs to be on it for sure? Well, that is largely determined by what you are interested in. An audio enthusiast will need different things than an RF (Radio Frequency) guy who needs other gear than a computer or home automation person. There are some things in common though and we will try to start there. A major common point is the need for non-conductive table top. Electrons like metal and so will flow through a metal top to anyplace they like. IE, a short circuit. Wood, plastic or anti-static rubber is good (be sure the wood does not splinter!). Be careful of things that can build up static. TinyCAD is a free schematic drawing program I just got and seems nice.